That said, thanks to improved technology, the best wireless headphones are giving their wired counterparts a run for their money, so you no longer have to worry about tripping on your headphone wire while running. The best workout headphones will tie the latest and greatest wireless technology with the high battery life you'll need to get you through a long run or day of training. Who wants to be isolated when they exercise? Replacing the AfterShokz Trek Titanium is the newer Air model. These are a touch more expensive, but they're lighter and we've found the sound quality has improved as well. You can keep chatting with those around you easily and if you're in a race you'll be able to hear the cheering from the sidelines too. What really sets these headphones apart is they're one of the few sets that are 'race-legal' in some countries, as they allow you to hear the commands of marshalls and traffic on open-road courses. If you want to run with music in smaller races, these are really your only option. 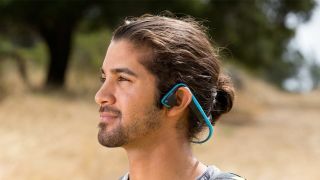 We found the Air to be more comfortable than previous AfterShokz models so if you don't mind shelling out a little extra money these will be one of the best for you. Plus they're sweat-proof, have a good secure fit and they can't fall out when you're jogging either as there aren't any earbuds. Alternatively if you're after an even more premium experience, the Jaybird Tarah Pro earbuds offer higher-quality audio and materials for a somewhat higher $159 (£139/AU$229) price tag. For runners with NFC-enabled smartphones and music players, the SoundSport buds can be paired in the blink of an eye. The Bose Connect app also allows music sharing with more than one pair of earbuds, ideal if you’re out running with a buddy (and we love that they name which device is connected, something that's great if you're carrying around a phone, media player and tablet). The SoundSport range comes in two flavors. For an extra $50 you can pick up the Pulse edition which features a built-in heart rate monitor. Depending on your training method, this could be a worthwhile investment as we've found their heart rate monitor to generally be fairly precise from the ears with these. The on-the-go charging case provides 13.5 hours of battery life in total (similar to Apple’s AirPods), but with just 4.5 hours available from a single charge slower marathoner and ultra runners will probably want to jog on - although for 99% of your training this won't be an issue. These are expensive buds, but the amount they can do is incredible - for many, they'll be your go-to choice.